There's nothing better on Valentine's Day, than to gift your loved one with some homemade goodies, especially of the baking kind. From cakes to pies, to delicious cupcakes, whatever you make will be from the heart, and will mean much more than any other gift you could give. With that in mind, Lucky Leaf has sent me a few Pie Fillings, a beautiful Rachel Ray muffin pan, some recipes and even cute gift bags and tags to use. 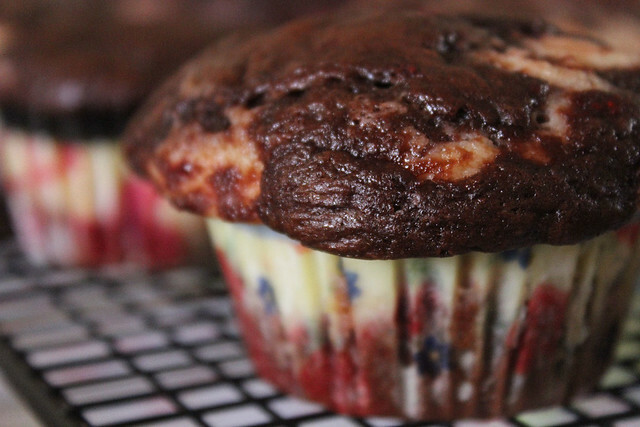 My children jumped right on it and asked for the Strawberries and Cream Chocolate Muffins. LOVE these liners, how beautiful are they? 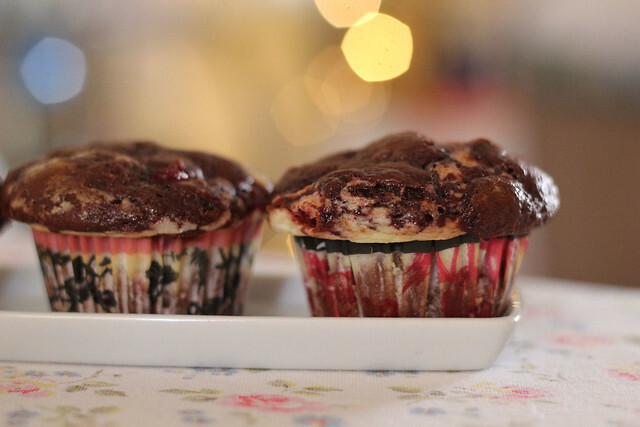 Lightly coat 24 to 30, 2 1/2-inch muffin cups with nonstick cooking spray; set aside. In a large mixing bowl, stir together the cake mix, pie filling and 3 eggs until moistened. Remove 1 cup of the batter and set aside. Divide remaining batter among prepared muffin cups filling each about half full. In a medium bowl, whisk together sour cream, 1 egg, sugar, flour and vanilla until smooth. Spoon small mounds of reserved batter over sour cream mixture in each cup (batter will not cover sour cream layer). Bake for 25 minutes or until tops spring back when lightly touched. Remove and cool in pans on wire racks for 15 minutes. Loosen edges and remove from pans. Cool completely. Chill within 2 hours. 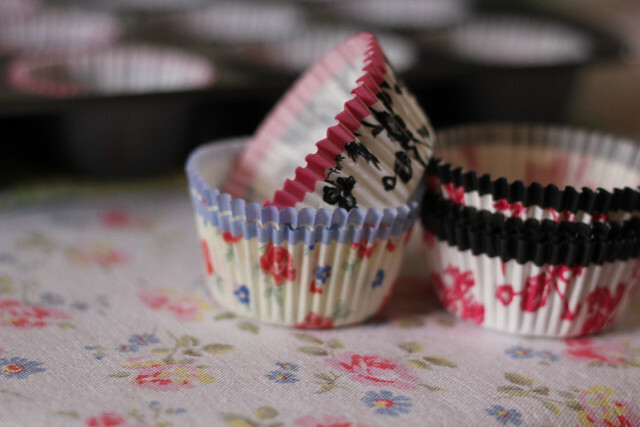 I chose to make mine in the cupcake liners, and I will tell you that they do fall apart, but it's because once you remove that liner you get that moist chocolate cake with the strawberry filling and the sour cream mixture. It is SO good. Perfect for Valentine's Day. Chocolate AND Strawberries. 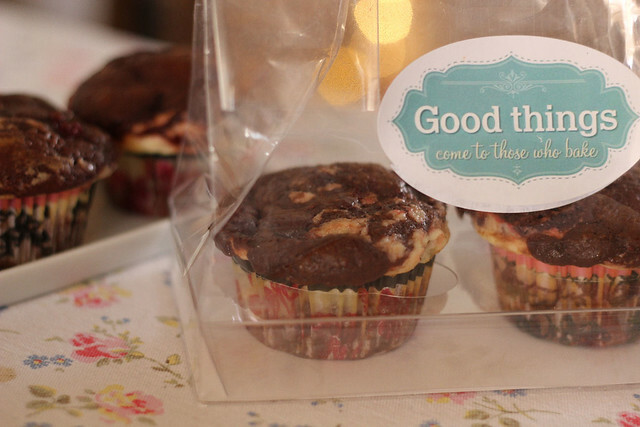 Lucky Leaf has put together an assortment of printables to make your day even more special. It's the perfect way to get the kids involved too, just a few ingredients, some adult supervision, and a delicious home baked goodie for their friends or mom or dad. 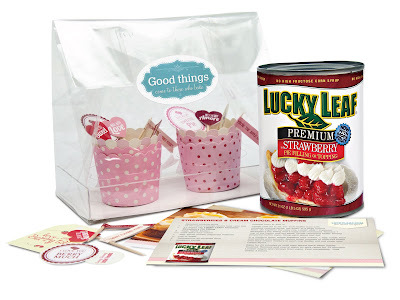 One lucky reader will win a Lucky Leaf baking prize pack that includes: a can of Lucky Leaf pie filling, a recipe card, fun and festive muffin cups and a bakery bag so you can bake it forward to someone you cherish. -- Open to all US residents only. Please make sure that you leave an email on the comment, so that I can contact you if you are drawn as the winner. -- You will have 48 hours to claim your prize once you receive my email, if I do not hear back from you within that time period, a new winner will be drawn. -- Winner will be drawn through Random.org, on Wednesday 13th, 2013. Lucky Leaf provided me with a baking kit for this review. All opinions are expressly mine. Oh my goodness, this recipe sounds fabulous! I don't think we have Lucky Leaf products here so I'll have to see if there is another strawberry pie filling. I don't know that I've ever seen any. I love strawberries. I'm baking, a lemon cream pie with raspberries. The only baking is the cookie crumb crust, but I do use Lucky Leaf's lemon pie filling, which I mix with cream cheese and whipped cream. 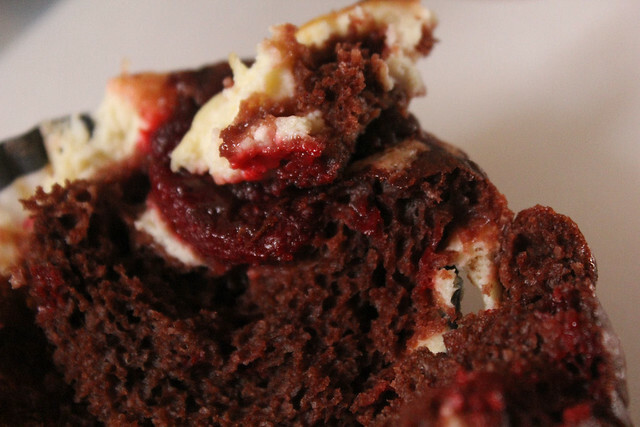 You pour the mixture over fresh raspberries that are layered on the butter of the cooked, cooled crumb crust. It's very pretty when you cut slices. Yes we will be baking. Just not sure what yet. 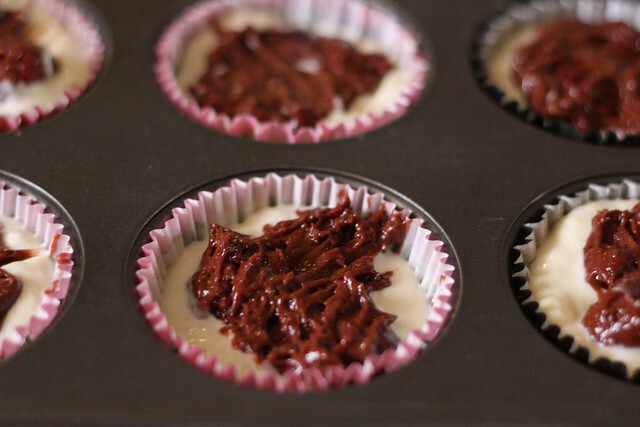 Since I don't like chocolate I may just make these. That way they won't tempt me to eat any. I'm working on losing weight. These look amazing! Can't wait to try them. Getting ready to make my Monster and Heart cutout cookies! I would love to make those cupcakes! 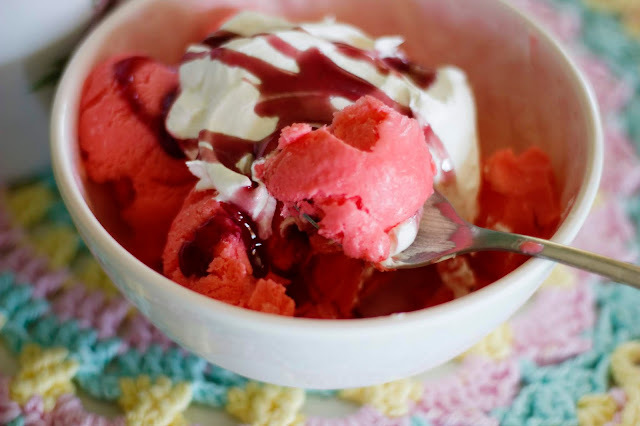 Would love to try that strawberry pie filling! Oops! Forgot my email addy! I would love to make my kids some red velvet cupcakes with red icing! I don't think I will be baking anything for Valentine's Day this year since we already have too many sweets in the house. I probably will baking some peach muffins for valentine's day. Nothing special, just something I have been craving as of lately. I plan to make some heart-shaped cookies this year. I am super excited to try this recipe! I have 2 girls and they LOVE to help with the baking...especially cupcakes :-) This year, I was planning to whip up some red velvet cupcakes with cream cheese frosting. I might just have to change that to this recipe instead! The girls and I will deliver them to my grandmother and a girlfriend of mine who has little ones as well. I am going to bake cupcakes for Valentines Day for my husband and son. I plan on giving a tray of them to my parents also. Yum! These look delicious! My two year old loves strawberries so in lieu of baking I'm making him and my husband chocolate covered strawberries. I'm going to make heart-shaped scones! I am planning on making my husband some fudge brownies with pecans in it! I plan on making "love" muffins! It's lent, so we'll go easy on the desserts for awhile. what a lovely giveaway! I am actually not planning to bake anything this year but my love of cupcakes has me rethinking my plans. 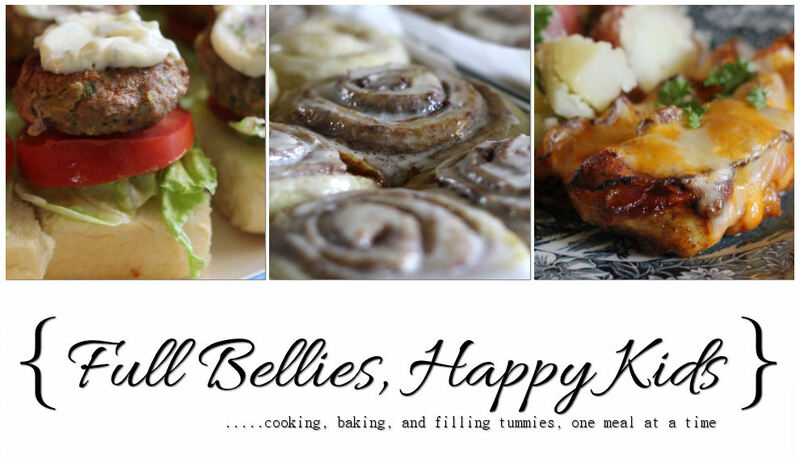 Love the site, always something that inspires me to get cooking!